Many companies are diving onto the compression gear bandwagon, and then there are some companies that have been specializing in compression gear all along. 2XU is a company that has been working in the athletic garment business for some time. 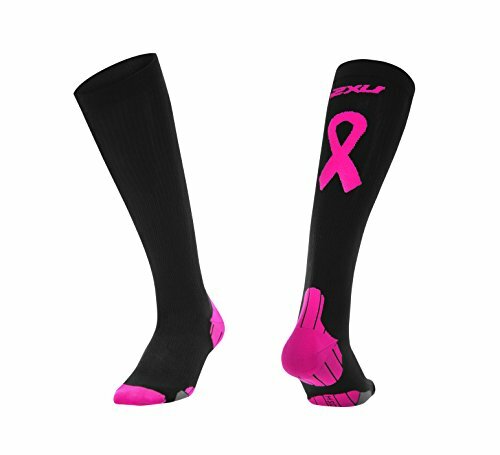 2XU compression socks aren't all they have to offer, but that's the focus here. 2XU may not be a name everyone on the street knows, but they do have a reputation for offering great products. They have been used in numerous countries, by major sports teams, and even by the US Navy Seals. Pronounced "Two Times You,” 2XU was launched in Australia in 2005 by a former triathlete. As a professional athlete, Jamie Hunt wanted to create products that he the field. So, he teamed up with Clyde Davenport (Australian retail guru) and Aidan Clarke (a marketing specialist) to create a brand that would specialize in running and triathlon gear. As the years progressed, 2XU grew to become one of the world’s most technical sportswear companies. They are a favorite of professional athletes and more. Athletes and fitness buffs also use them on a non-professional level. The company prides themselves on creating the best gear possible, for athletes and runners. They back up their equipment with science and technology. They do immense amounts of testing and research to make sure their products, including the 2XU compression socks, do what they are meant to do and that they do it well. They care about protecting the people that use their products. For almost a decade, 2XU has been researching sportswear and compression gear on a regular basis. It's part of what makes them the best. They work with the Australia Institute of Sport (AIS), which is a world-renowned company. They also work with RMIT University. These studies and collaborations help assure buyers that they are getting the best and lasting products and gear possible. PWX compression fabric is what 2XU uses in its compression gear. The PWX compression fabric is a material that was created using advanced technology to ensure medical grade compression in the products made with it. The company has developed a fabric that remains lightweight and flexible, while still offering the best in performance. Compression socks wouldn't be able to do their job correctly if it weren't for the use of controlled compression. It's the compression that helps reduce fatigue and lets athlete recover faster after a workout. 2XU uses a controlled graduation profile. The controlled graduation increases blood flow, and it also improves lymphatic drainage. These are essential functions when it comes to performance athletes using them. Not only is the PWX compression fabric a durable material made from high-filament nylon yarns, but it also creates comfortable compression gear that athletes are happy to wear. Repeated wear won't break down the stability of these compression garments, so you're investing in a durable product. If you're looking for some compression socks to wear during your training, whether you're a runner or an athlete of some other kind, 2XU offers a plethora of options for both men and women. Here are seven top choices, some for the guys and some for the ladies. Available in a few color choices, the 2XU Women's Race​​ VECTR Socks offer more speed because of exceptional engineering. They have the X:LOCK support system, which gives you a secure and ergonomic fit. It also stabilizes the ankle and the arch of your foot. With this protection, your feet won't get tired as fast, and you'll avoid the pain that comes with wearing down your muscles. For more freedom from pain, these socks have abrasion protection, with cushioning in the heel and the forefoot area. Made with mesh panels, your feet get plenty of ventilation. Ventilation helps keep your feet dry and prevents them from getting stinky. The antimicrobial nylon fabric is also antimicrobial. The linked toe cage gives more than comfort – it prevents you from getting blisters. All of this on top of the compression abilities, and you have a great sock to run marathons or jog around the block. Available in an array of colors, the 2XU Performance Compression Socks are socks any runner can get behind. 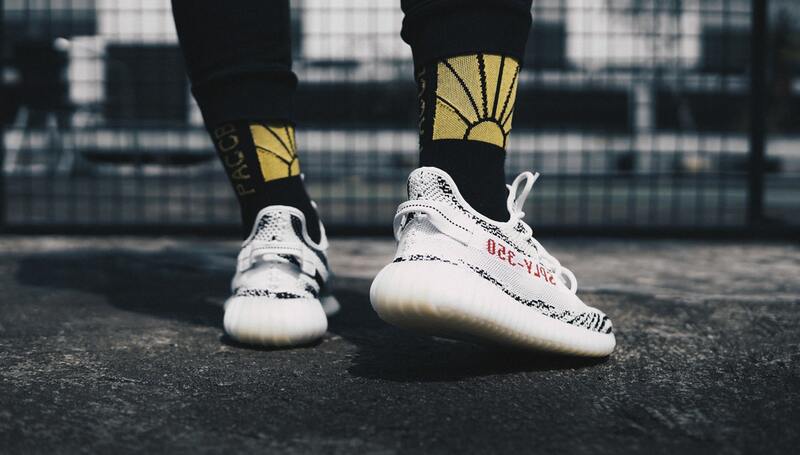 Not only do these socks look good, but they are also one of the most technically advanced socks you'll find right now when it comes to compression gear in today's market. They have zoned breathability panels, so your feet stay dry and comfortable. The compression panels are zoned as well, and they are seamless so that they won't cause any blisters. You'll know your muscles are getting the care and support you need anytime you pull these socks on. These are lightweight socks, even though they look pretty heavy-duty. With 2XU’s 360˚ support, you'll be working to prevent shin splints and other injuries no matter what terrain you're running on or how long you plan to run. If you want compression socks with a little bit of fashionable flair, these striped compression socks are just what you need. They come in multiple color variations, and they look great while being extremely functional. 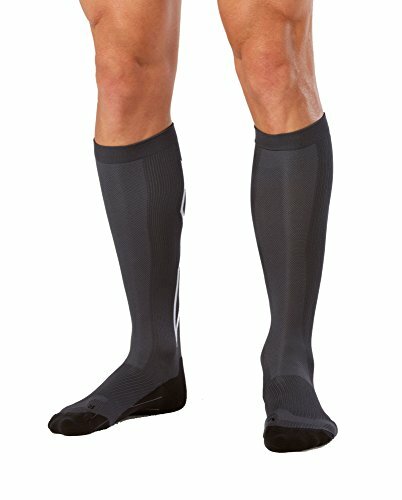 The Striped Run Compression Socks from 2XU support your calf and shin, as well as your feet. They have the same features as the compression socks above, including breathability ad gradient engineering. Wear these sock before, during, and after a workout. They are socks that will help with the warm-up and recovery process, and they help prevent fatigue during your exercise, whether you're running or biking, or doing something else. 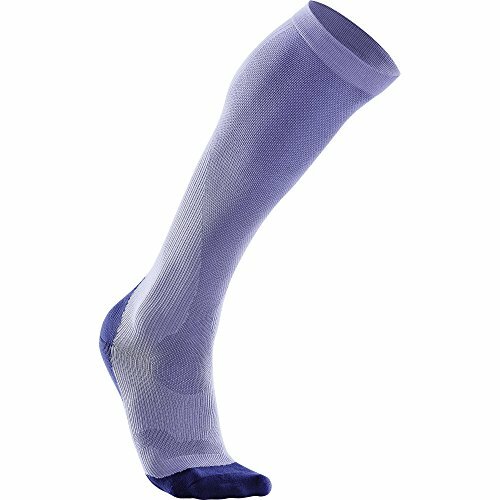 If you're more about function over style, this pair of compression socks is a good choice. You still get a myriad of color options, but there are no fancy designs here. Just like the men's version of these socks, the 2XU Performance Compre​​ssion Socks​​ are the best out there when it comes to performance and durability. If you run for a living or play a professional sport, investing in a pair of socks like these from 2XU is an excellent way to protect your career and your feet. Compression gear is about more than increasing performance – it's also about recovering safely and quickly so you can get back out there and do it all again tomorrow. If your step is off, it can seriously (and maybe permanently) hurt your feet, shins, ankles, and even your knees. 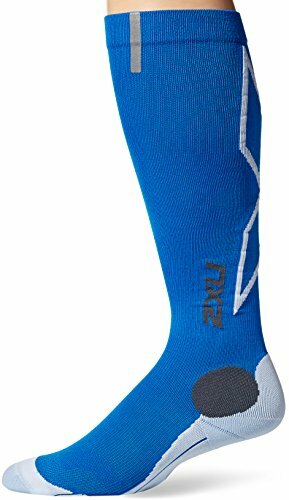 The recovery compression socks from 2XU have just what you need for recovery. These socks are designed to correct the left and right footbeds anatomically. 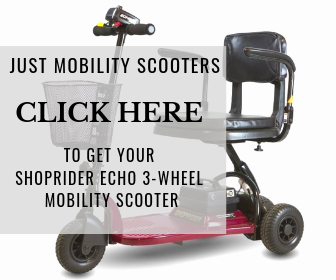 They do this by utilizing specially designed footpads, as well as arch positioning, which work together to support your foot properly. You will still get all of the other benefits of compression socks as well. They have gradient pressure, venting panels, and they're comfortable. You can wear these after you finish running, training, or riding. Put these versatile socks on anytime you're in a static position, whether you're standing or sitting. You'll find that you recover faster, even from the most intense workouts, when you use these socks after you're done working out. If you're in need of extra muscle support, the HYOPTIK Socks are the best choice for you. Not only do they fight fatigue and keep your shins safe, but they also have those breathability panels to keep your feet comfortable and dry. One of the benefits that sets these socks apart from the other 2XU compression socks on this list is they have a reflective trim to make you visible when running in low light. The Performance X socks are great for warmup and recovery. Like the rest of the compression socks from 2XU, they are durable socks you can expect to last awhile (longer than the competition). Antimicrobial, with the ability to wick moisture from your skin, these socks will keep you dry when you wear them during a run or working out. They offer excellent support for your shin, calf, Achilles, and ankle. The zoned footbed keeps you moving at a steady pace, without foot pain or fatigue. 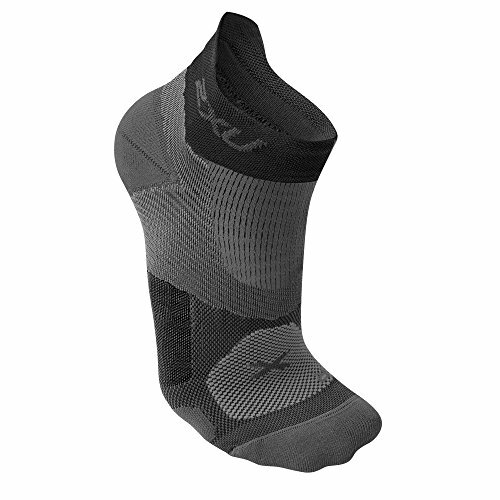 There are a few things that go into picking the 2XU socks that you need. Consider what you need them for first, and then what kind of style you're looking for. Price can factor in, as the different types and styles vary in price. Decide if you need performance socks or recovery socks, or something that doubles as both. Figure out which parts of your feet need the most attention when it comes to protection. 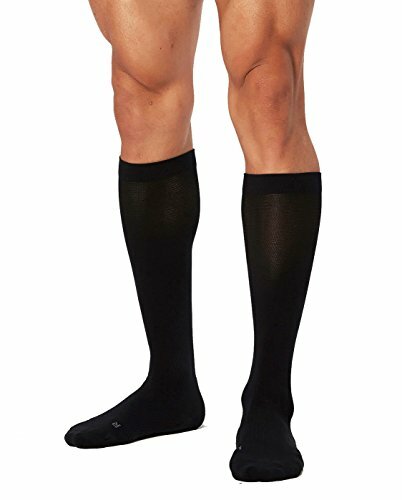 If you get shin splints often, you'll want knee high socks that will offer you shin support. If you want foot protection only, you can settle for lower cut socks. You may like the look of them more as well, but you always need to consider the actual protection you're seeking. Running and fitness put a lot of strain on the legs and feet. No matter what, you should be protecting them with compression socks. Whether you choose to buy 2XU or not, compression socks are a wise investment for runners and athletes of all kinds. If you’re not sure about buying 2XU because you've never heard of the name, or maybe you're looking for a company in the U.S. to purchase from but you want something in a compression sock that is comparable to the quality of 2XU, the closest you'll get in the states is Nike. Nike offers an array of compression socks with excellent features and materials. They are also comparable in price. They don't have the science and research put into them as much as 2XU does though, so you risk not buying from a company with a focus on compression gear. However, both companies do have a focus on sports and sports safety, which is another reason why Nike is your best second choice when it comes to purchasing compression socks. Both brands offer all of the things you'll want and need from a compression sock. That include graduated compression, wicking properties, and tons of comfort. If you want compression socks from a company that works hard to make sure all of their products are the best out there, 2XU compression socks should be the first socks on your shopping list. Check out the company's website for return policies. You want to make sure you always order the right size.